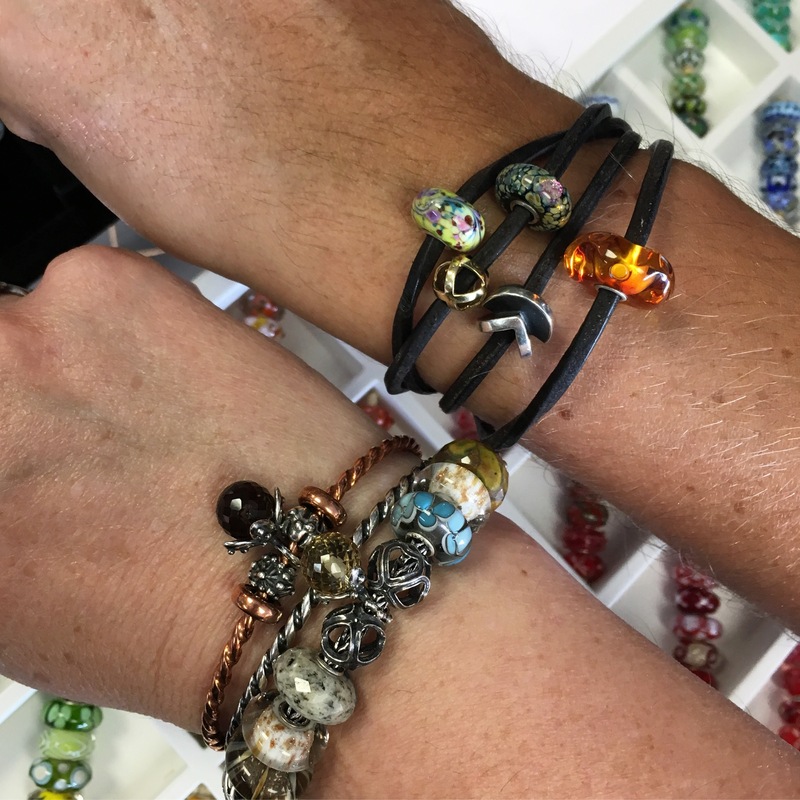 The Bead Bash on the Lake that was hosted by Great Lakes Boutique in Ohio was so much fun! 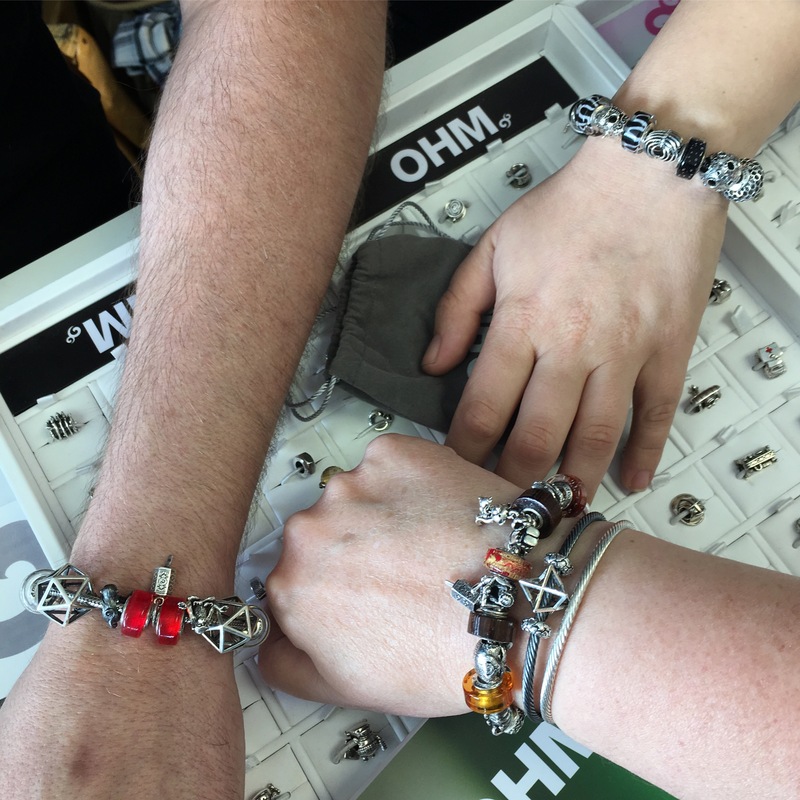 Sure it was great to see all the beads in person, but the best part was getting to spend time talking with Julia, her husband Alexey and Jenny and Mike from Ohm Beads, plus some ladies from Canada and the USA. What a lovely and sweet group of people! 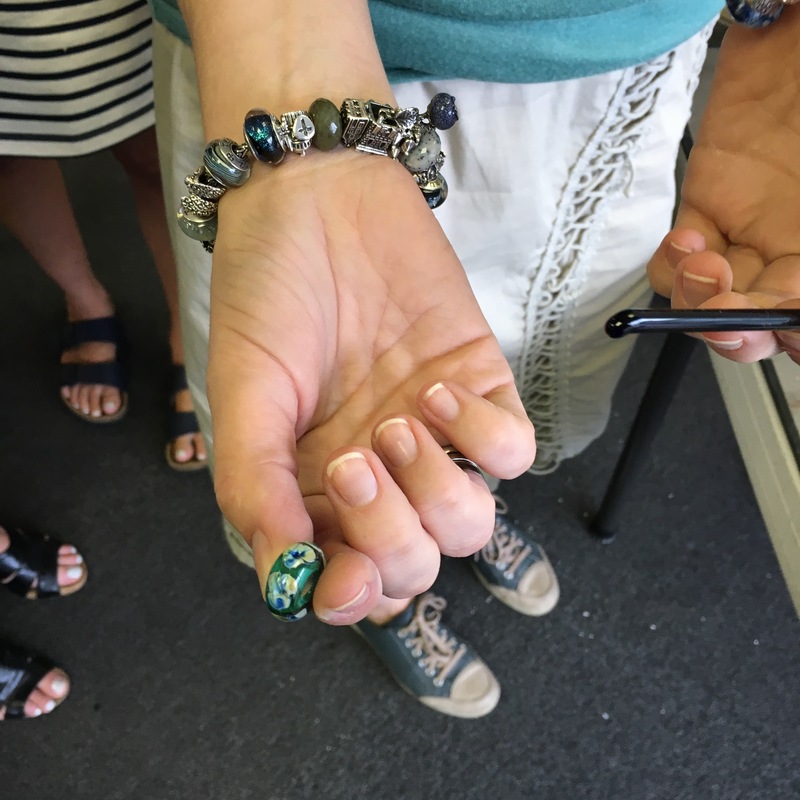 The people at the Great Lakes store were incredibly hospitable, especially Casey and Rick and we even got to make a glass bead under the guidance of Julia! 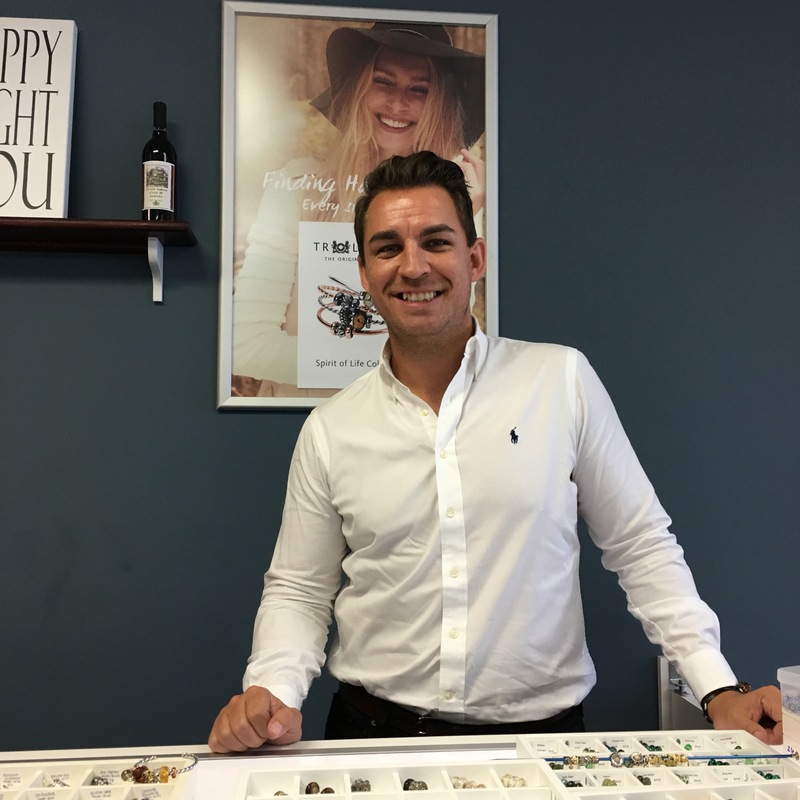 First we visited a Trollbeads store on our way there. It was fun to see a display of all the fall beads. 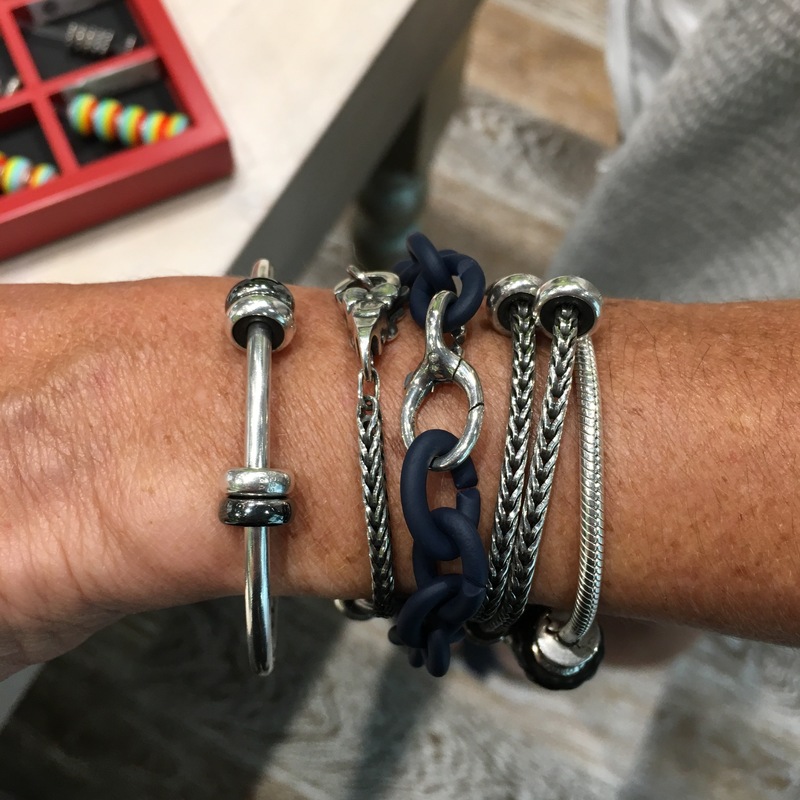 Trisha bought a lock and got some navy X links! Notice how her bracelets are looking rather empty right now. That won’t last. At Great Lakes we had lots of fun taking many beads n’ coffee style photos. Here is me on the left and Julia on the right. Then Mike at Ohm, left, me and Jenny at Ohm on the top. Of course, some selfies were in order also. That’s Mike, Julia, Jenny and me. 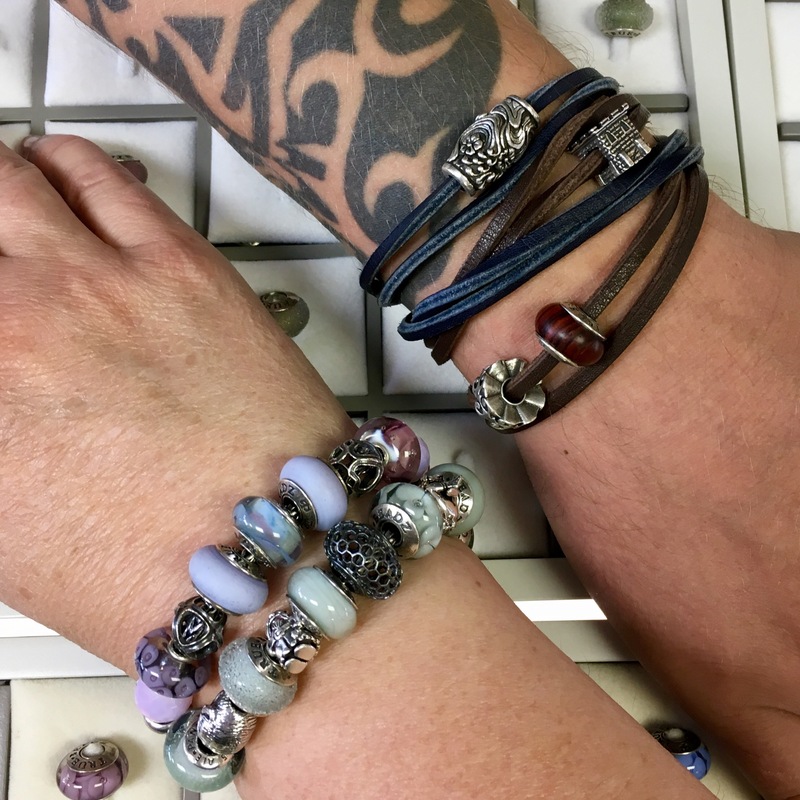 Next up is me on the left and Nicholas from Trollbeads USA on the right. Love how his amber bead appears to be glowing! I also got a photo with Julia’s husband, Alexey. He makes the silver True Beadz and they are SUCH a sweet couple! 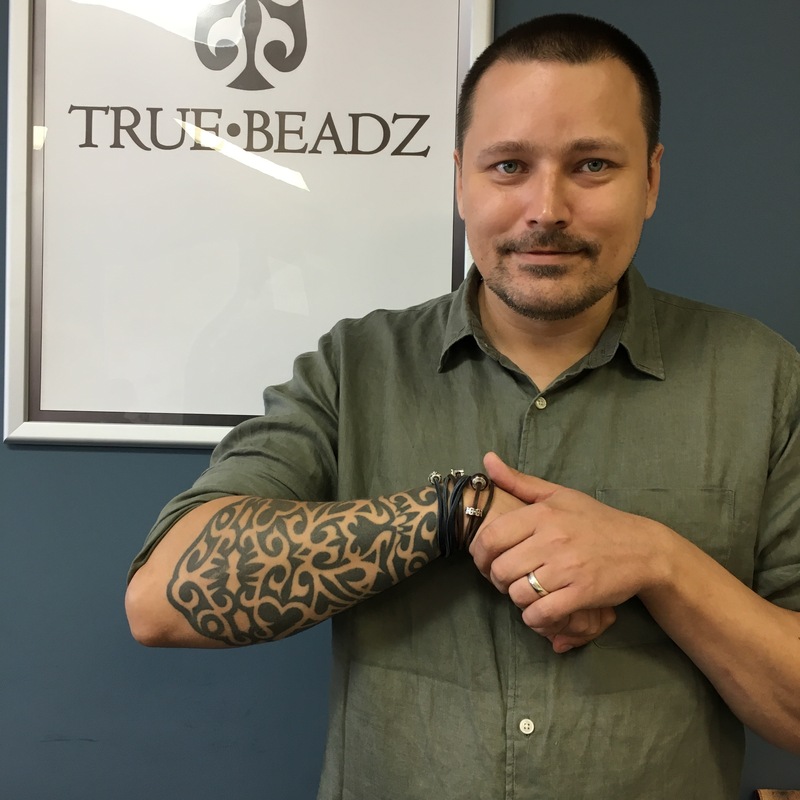 The tattoo on his arm has the True Beadz logo! We got to watch Julia make a frog bead! And in the photo below, this is a flower bead she made using the glass on the right. It was fascinating to see how the glass would change colour as it heated up and cooled down. And she very patiently helped us to each make a bead! This is a collage that Trisha made for her Instagram. This is my bead! It’s a deep purple. It was really difficult and awkward to make the beads and helped us to appreciate the artistry and skill that goes into making them! Julia had brought some balloons! There was a little party at the hotel that night. GLB bought drinks, pizza and wings (again, amazing hospitality) and we brought some Ketchup chips from Canada, which lots of Americans have never heard of. Sarah brought some Glow-Sticks we could wear as bracelets and we passed them out. 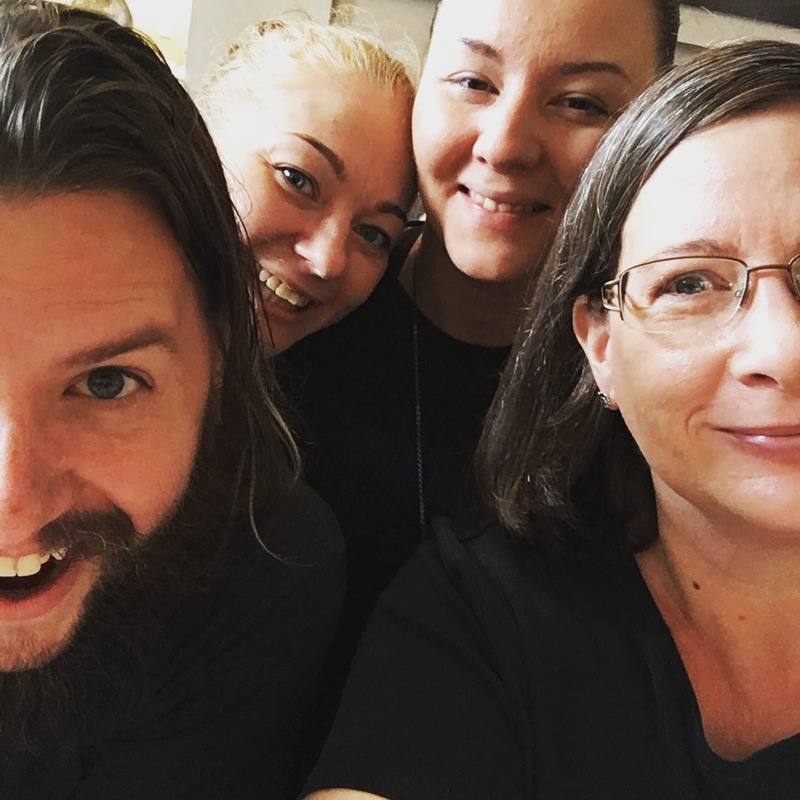 I *think* this photo below is of Kim, Lisa, me and I’m not sure of the fourth person, sorry!! This is Kim and Lisa below. Lisa flew in from California, but since she was originally from Canada she was happy to see the Ketchup chips! Kim bought some of Alex Cramariuc’s Amber beads (Kim, please correct me if I’m wrong) and they certainly are gorgeous, as are his silver beads. 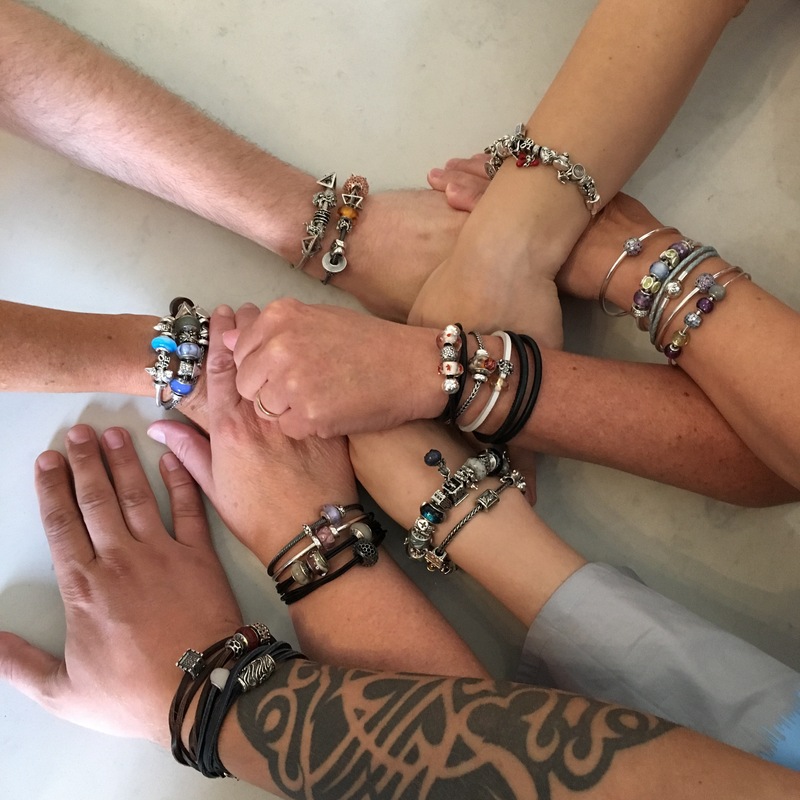 At the last breakfast we took a huge group bracelet photo. I spy Mary and Chris from Canada in the back! Here’s a bonus video! Make sure your sound is on! Love this post! 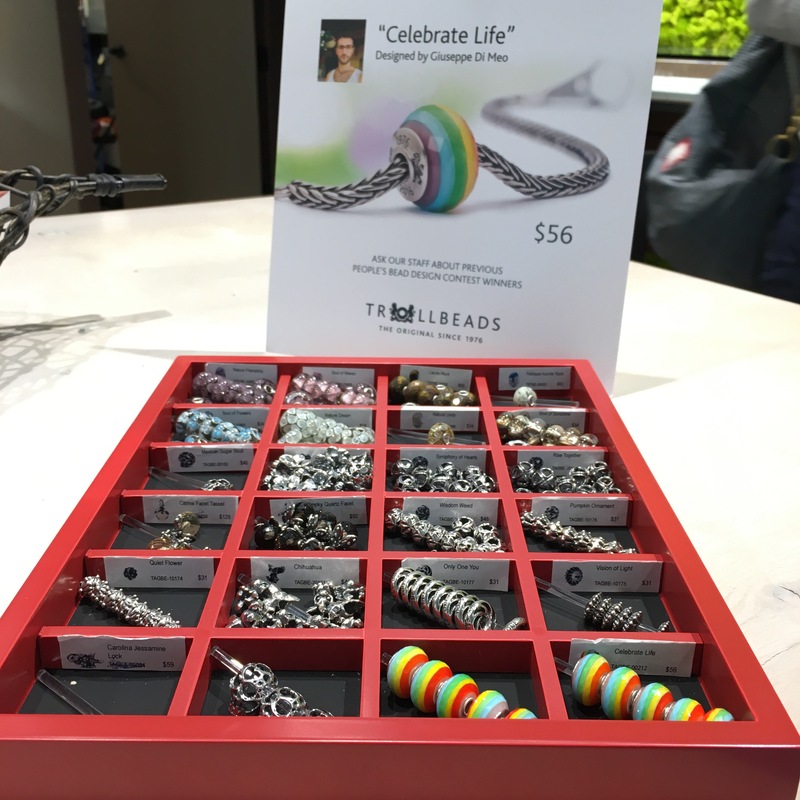 Bead Bash was such a great event! Not just the awesome beads but wonderful people too! The bonus video is amazing! And it seems we have something to look forward to, I hope! Yes, Mike gave me a few of the upcoming (preview Sept.22/release Oct. 1) Ohm Beads to use in the video, so some sharp eyes will spot them! This is wonderful Martha! It really was a great weekend and I love that you took the time to put all of these fun and happy moments all together . I love your scary movie, too. I will look at this post many times as it keeps everything fresh in my mind and heart. You captured the mood and the importance of such a get together perfectly. Thank-you! 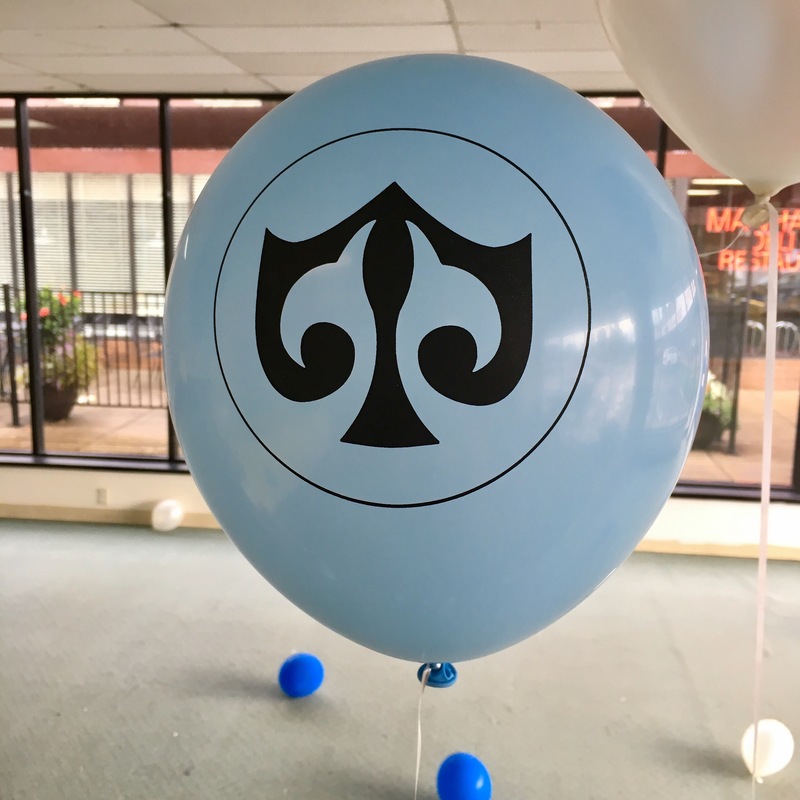 Glad to see photos of the event and see how much fun you all had. The video at the end was super cute! Quelle chance. … je ne sais pas si en France il pourrait y avoir ce genre de rencontre. ..
Oui, c’etait une bonne chance! Well, I had a big meeting this weekend, just medicine talkings, blablabla… I really missed your posts! Wish I could be with you, lots a fun!!!! And loved, as always, all beads. I tried to buy some True Treasures, but they were sold out when I had time to access… Great weekend and so funny movie!!! Thank you!!! Carla, you would have had so much fun! Glad you can see the photos, at least. Looks like everyone had a wonderful time. Thanks for sharing the experience! It was so much fun April! You would have loved meeting the Ohmies, especially after having bought your dino skull. I have been following you guys during the weekend and it looked so much fun!! Thank you all for posting pictures and keeping us informed! Love, love, love Scary Movie! I am hoping to meet up with the Ohm people when I visit Seattle in November again, I met them last year! Glad you enjoyed following along, Trudy! I will look forward to your pics in November! Sonya, I just saw the photo on IG of you making a bead with Julia! Wasn’t that such an amazing opportunity? Lol!! Thanks! Your mcctrish video is not slowing down on IG! Lolz on the bonus video how fun! Thanks for th updates and the pix Martha! It’s a great way for those of us that we’re unable to attend to feel included. Must have been amazing to we so many awesome beads in person. 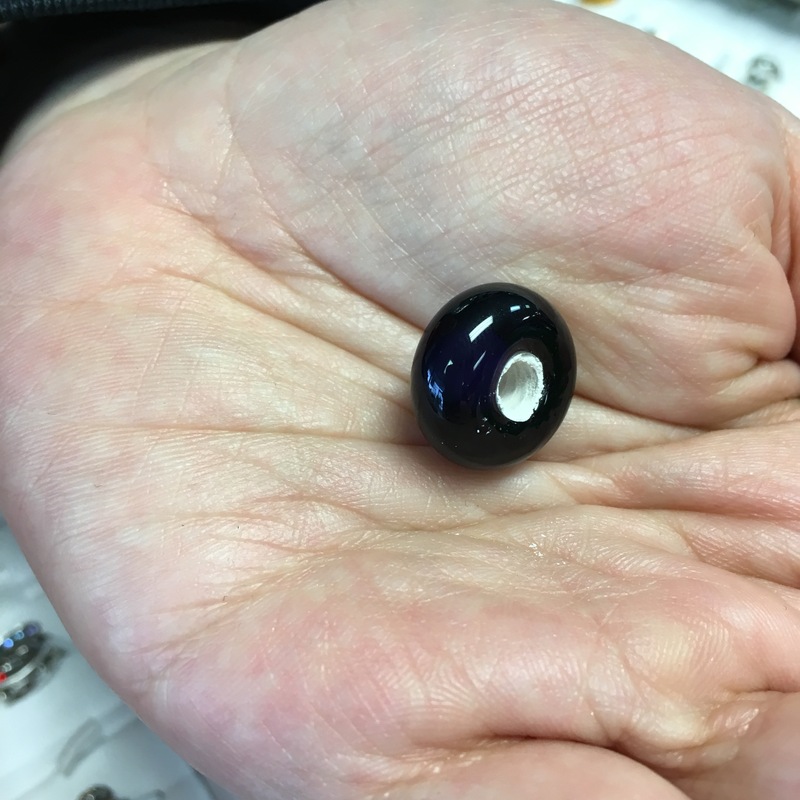 The last few days pix and posts makes me want to get my very own true beads ( are the glass beads about the same size as ohm round glass or Pandora glass ?) hmmmm temptations haha…. Alex, the True Beadz glass tend to be slightly bigger than Trollbeads. I will make that my post for Wednesday and will take a photo of a bunch of different brands on a rod for you. 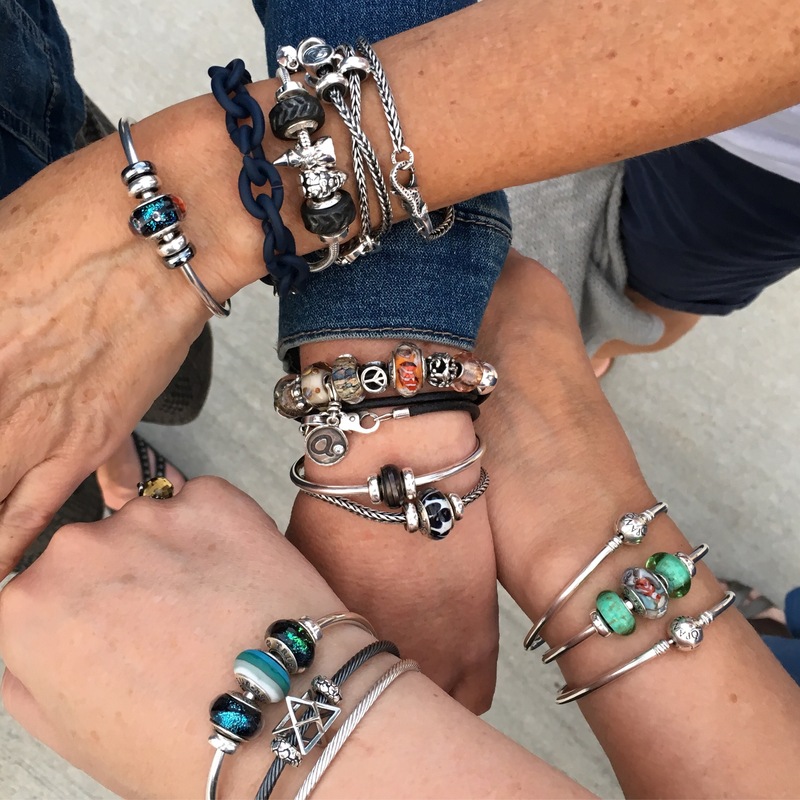 Thanks for this great recap Martha, all the pictures and bracelets are great! I love the video at the end, such a great production 😀 Looks like some more dirty Ohm Beads are coming! You are correct Natalie and thanks! Thanks Kit! And thanks for sending Mike and Jenny! Great seeing you at GLB again! It was an awesome event! 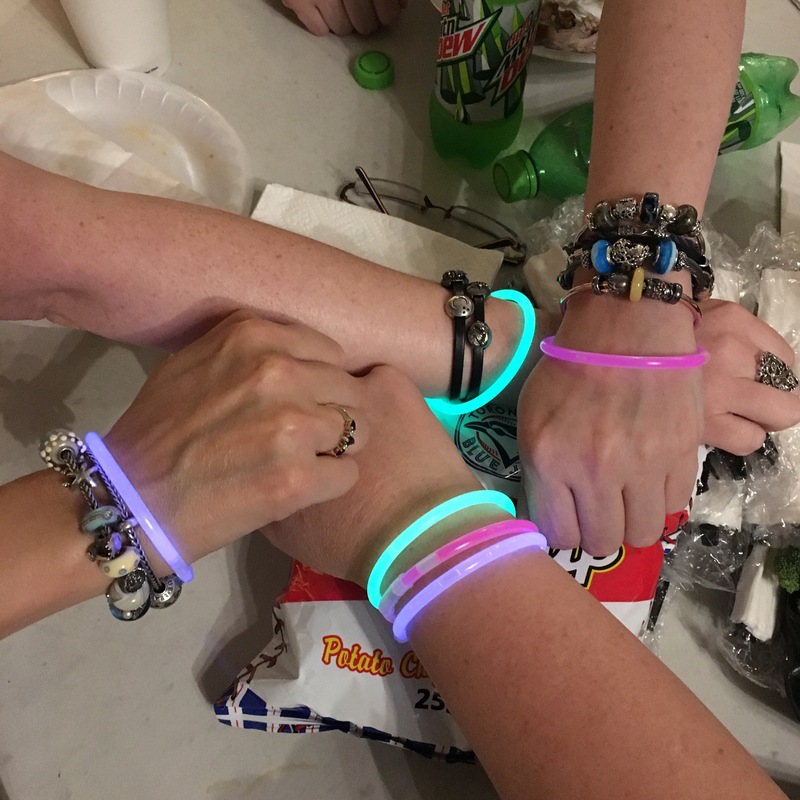 And that mystery wrist was mine-Thanks for the glow bracelet and fun over the weekend! Loved the Poutine chips!💕 Everyone’s beads were amazing! Yay, it was you! I was pretty sure but didn’t want to make a mistake. I think I’ll buy those Poutine chips for the family sometime. And that ‘bumpy’ cake was yummy, thanks for sharing! Thanks Amanda! I totally agree! Love it Martha and thank you for posting so many fab pics for us poor souls who couldn’t be there. 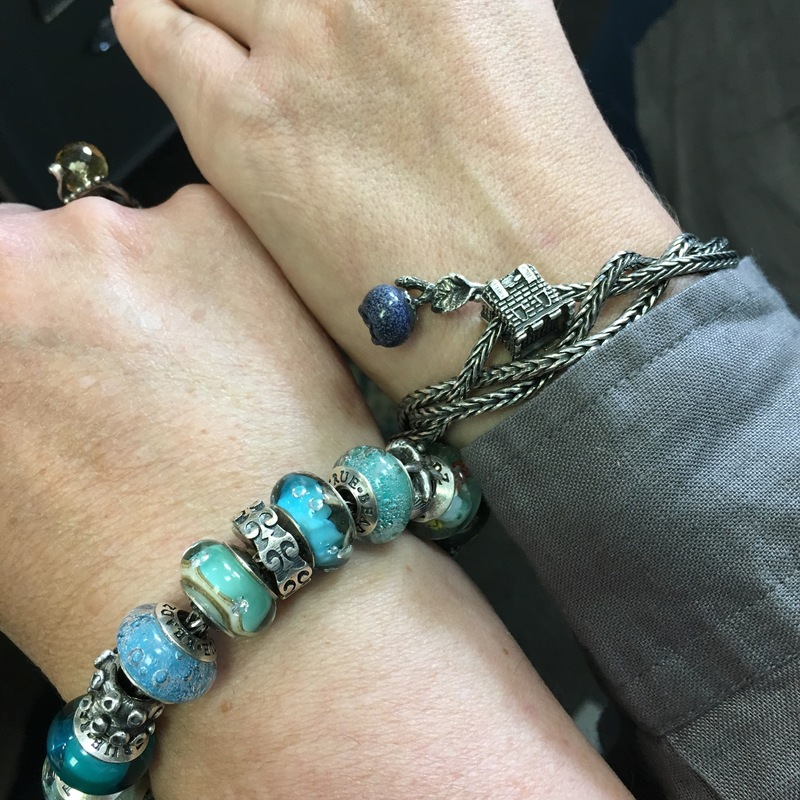 Love your post, and all of the wrist shots! Yes, my bracelet contained several ACA ambers. That Alex is a VERY dangerous man! I probably overspent, but how often does such a chance come one’s way? I’ll just have to be good for a few months! 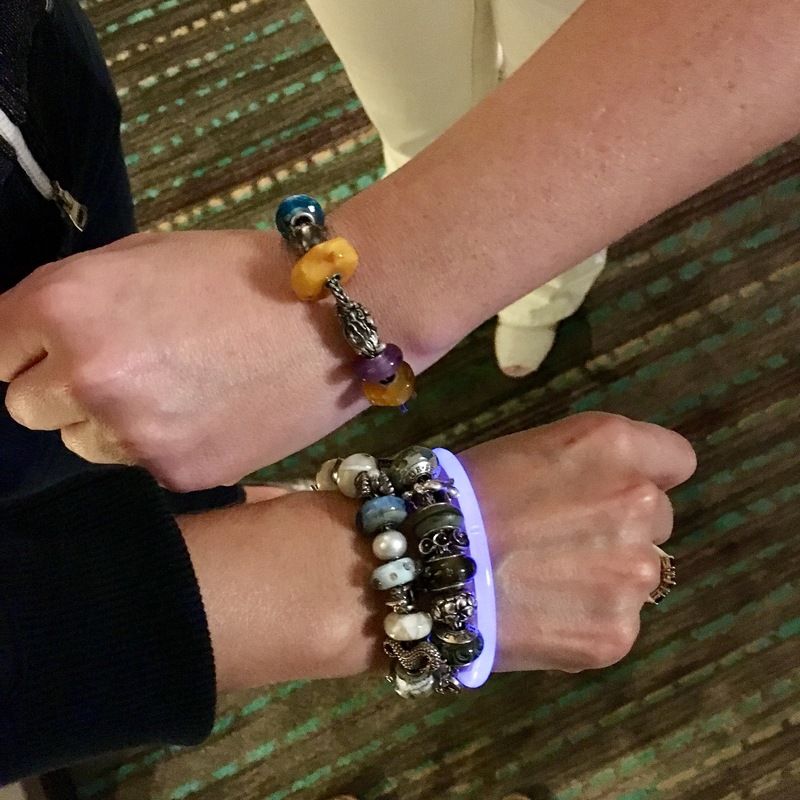 I loved the glow in the dark bracelets, by the way – what a fun touch that was! I brought mine home with me. 🙂 It was such a great event, and I had a fantastic time meeting all the brand reps and so many lovely collectors as well. I’m still riding a high from the weekend right now. Great video, by the way! It was such fun to meet you, Kim! And to see your gorgeous beads! I’m still riding a bit high, too, but think I’ll be crashing early tonight! Glad you got home safely. Enjoy your new beads! 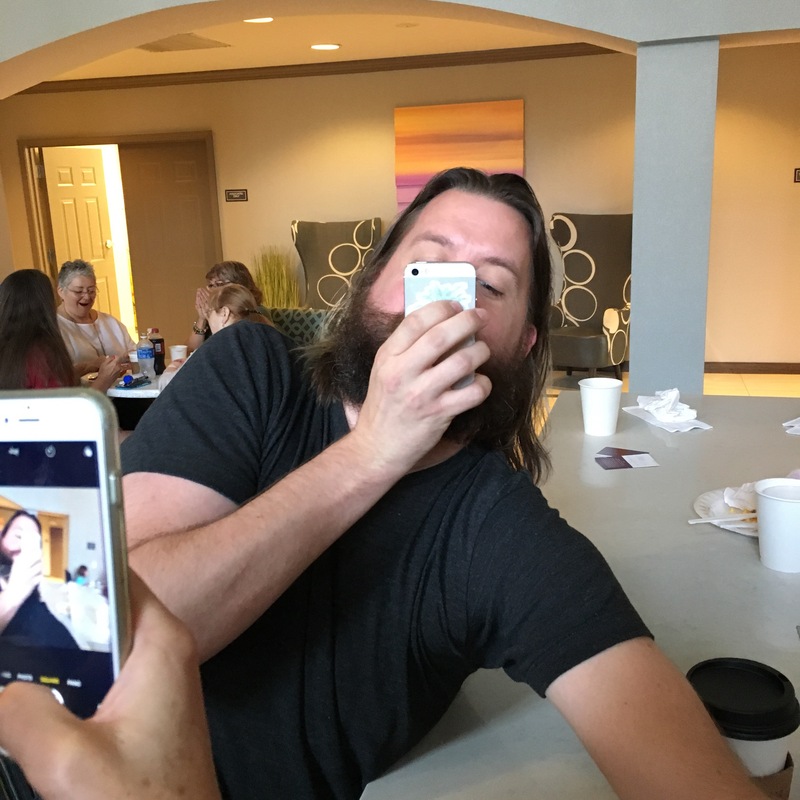 Great recap – makes those of us who were unable to make it feel like we were there! 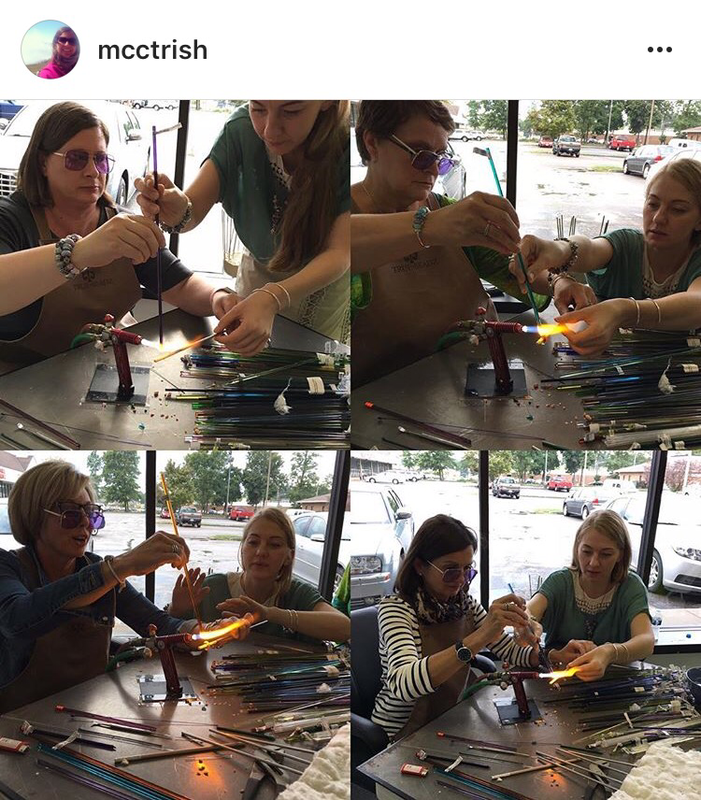 I could watch the video of Trisha mcctrishing with Julia over and over again 😀 And what an experience that you got to make beads with Julia! It’s amazing to see all of the reps together! Tracy, I also just love the video of Trish and Julia. You can see the genuine affection on their faces and it’s so heartwarming. 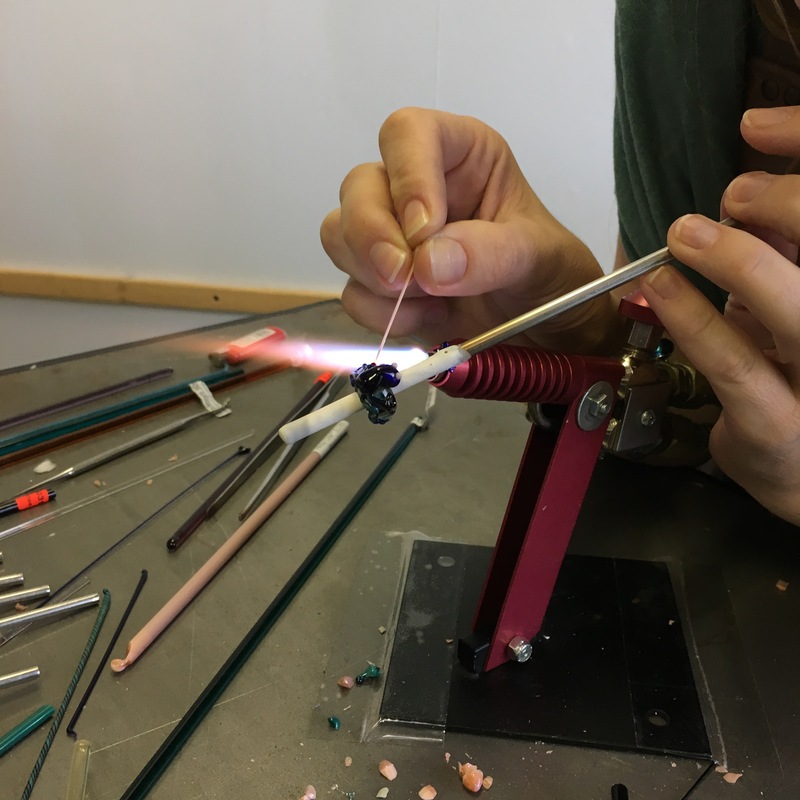 It was totally an amazing experience to make a bead! And she was such a kind and patient teacher! Aww, was hoping someone would post a pic of Victoria or did I miss it? Francine, there’s lots of pics of her and Alex on the True Beadz and Mike at Ohm Facebook and Instagram pages and I imagine she’d post some pictures after her trip. Thanks so much, I will go over to look at their pictures. I wish I could have gone to the Bead Bash but had too much going on. I have been posting on Victoria’s site for a few years and I just love her. She has a lovely personality. I’m glad you enjoyed the pictures! Maybe you’ll be able to go to another event in the future, as I think there will be one in April and maybe even again next September. I really enjoyed all the photos and have roped my sister and mom to go in the Spring. I’ve never been to Niagara Falls either so we are talking about taking extra time and driving around the Canada side of Lake Erie on the way home. I am so curios about Julia’s True Tower bead. I ordered one and expexted it to be just the tower. That said, I’ve now seen the ones she brought with her with a dangle attached. Can you share what the story with those are? Thanks! P.S. I just got the scary bead video to play…bravo to the talented cast, producer & director! 🙂 …and pardon the variety of typos previously…big fingers, tiny phone keys! Ooo…driving around to the Canadian side of Niagara Falls would be a great idea. Be sure to walk to the part where the water is going over the falls-so cool. The True Tower is definitely just the tower. It’s just that I guess you can fit a dangle of your choice inside it and it works! Thanks for the tip about the walk and good view…that can make all the difference! and the info on the tower bead, sounds intriguing. So grateful to have one on the way! Thanks Svetlana! I’m glad you felt like you were enjoying it along with us. Mission accomplished! Martha, Thank you for this lovely summary of your trip, meeting everyone, and seeing all the beads. Photos are inspiring as always. I LOVE Alexey’s tattoo!! 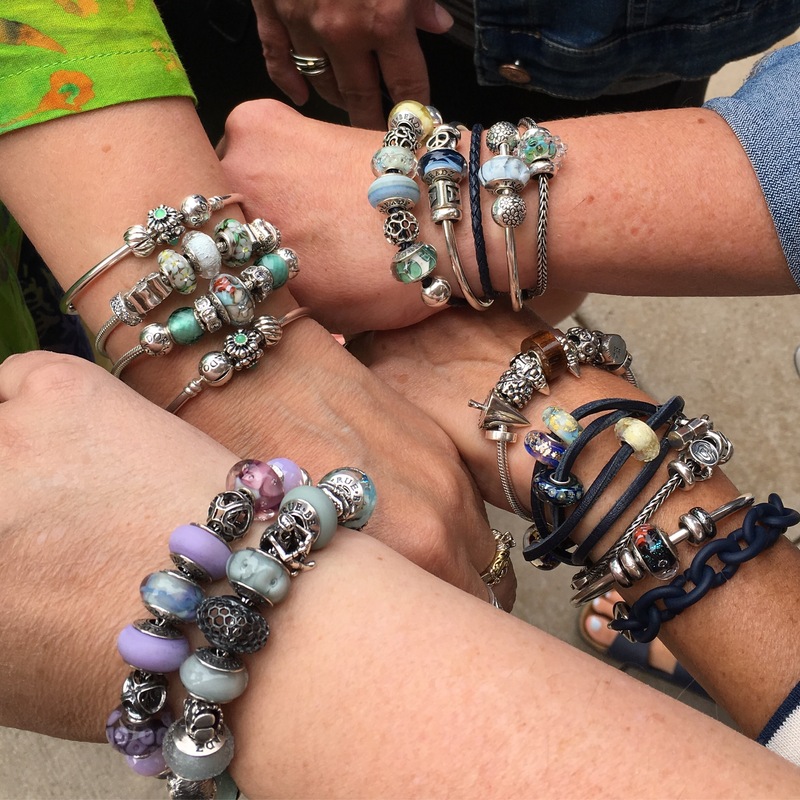 What is better than shared bead love and appreciation, and photos of everyone’s bracelets!? I love the bracelets. Everyone’s arms crossed are so symbolic of the “fellowship” of the bead makers/lovers. That to me says it all! Such a supportive group. Faye, I so agree with what you said about the arms crossed, especially in the last photo. That one will always be my favourite. And yes, Alexey’s tattoo is so awesome!! Yes the last one says it all. Unity. That Gnome Scary video is to die for, LOL! scary video is THE BEST!!!!! Hi Mary! I’m so glad you introduced yourself. It was so nice to meet more Canadians! That was such a fun weekend. Glad you made it back safely!